I lived through eight years of the Clintons and then eight years of Bush. Through it all, gay people were treated at the federal level like embarrassments or impediments. With Clinton, we were the means to raise money. With Bush, we were the means to leverage votes by exploiting bigotry. Obama seemed in the campaign to promise something else. I listened to him in the early days and found him sincere about ending discrimination by the government; and I came to respect, while vehemently disagreeing with, his position on federal civil unions. He seemed genuinely distressed that gay servicemembers should be treated with contempt and persecution by their commander-in-chief, that gay couples should have to fight for basic human treatment – like entry to hospital rooms, or being able to stay in the same apartment as their late spouse, or forced into cruel separation by immigration laws that treat gay couples as threats, rather than assets, or if you had the temerity to survive HIV, being treated at the US border the way Jesse Helms always wanted people with HIV to be treated – like perverts and pariahs and threats. It is quite something to have a government stamp in your passport, as I do, that will tell any immigration or police officer with a connection to a government database that I have HIV, that I am therefore a threat and can be arrested and detained and deported at the border if necessary. I’m a big boy with money and a robust self-esteem as an HIV-positive survivor, but I think of thousands of others far less powerful and wealthy than I am who are afraid to enter or leave the US because their HIV status renders them criminals. I think of how the US is the only developed country – and one of only a handful of undeveloped countries – that still tells the world that people with HIV are dangerous pariahs, who need policing at borders and deporting if discovered. And yet this is the current policy of the Obama administration on global HIV and AIDS. And it’s tedious to whine and jump up and down and complain when a wand isn’t waved and everything is made right by the first candidate who really seemed to get it, who was even able to address black church congregations about homophobia. And obviously patience is necessary; and legislative work takes time; and there are real challenges on so many fronts, especially the economy and the legacy of war crimes and the permanently restive Iraqi and Afghan regions we are constantly in the process of liberating from themselves. No one expects a president to be grappling with all this early on, or, God help us, actually leading on civil rights. That’s our job, not his. But I have a sickeningly familiar feeling in my stomach, and the feeling deepens with every interaction with the Obama team on these issues. They want them to go away. They want us to go away. Here we are, in the summer of 2009, with gay servicemembers still being fired for the fact of their orientation. Here we are, with marriage rights spreading through the country and world and a president who cannot bring himself even to acknowledge these breakthroughs in civil rights, and having no plan in any distant future to do anything about it at a federal level. Here I am, facing a looming deadline to be forced to leave my American husband for good, and relocate abroad because the HIV travel and immigration ban remains in force and I have slowly run out of options (unlike most non-Americans with HIV who have no options at all). And what is Obama doing about any of these things? What is he even intending at some point to do about these things? So far as I can read the administration, the answer is: nada. We’re firing Arab linguists? So sorry. 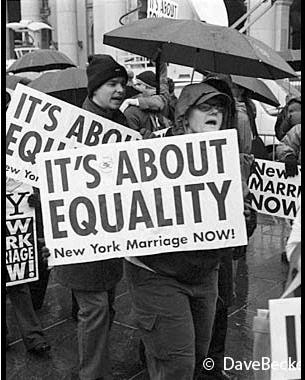 We won’t recognize in any way a tiny minority of legally married couples in several states because they’re, ugh, gay? We had no idea. There’s a ban on HIV-positive tourists and immigrants? Really? Thanks for letting us know. Would you like to join Joe Solmonese and John Berry for cocktails? The inside of the White House is fabulous these days. Yesterday, Robert Gibbs gave non-answer after non-answer on civil unions and Obama’s clear campaign pledge to grant equal federal rights for gay couples; non-answer after non-answer on the military’s remaining ban on honest servicemembers. What was once a categorical pledge is now – well let’s call it the toilet paper that it is. I spent yesterday trying to get a better idea of what’s intended on all fronts, and the overwhelming sense – apart from a terror of saying anything about gay people on the record – is that we are in the same spot as in every Democratic administration: the well-paid leaders of the established groups get jobs and invites, and that’s about it. Worse: we will get a purely symbolic, practically useless hate crimes bill that they will then wave in our faces to prove they need do nothing more. Translation: we’re doing the bare minimum to make us look no worse than Bush, but we have no real interest in this and are letting the bureaucracy handle it, and we guarantee nothing. On gay servicemembers, the president is writing personal notes to those he has fired and intends to continue firing. Will he write some personal notes to the people with HIV he deports? Will he write personal notes to the gay spouses suddenly without a home or their late spouse’s savings or forced by his administration to relocate abroad because he has no intention of actually fulfilling his promises? I have a feeling he died laughing. What else are you gonna do? I agree 100%. 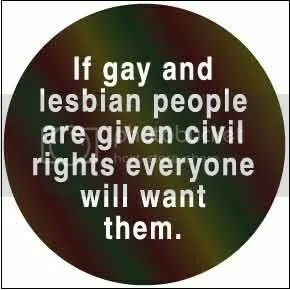 Gay rights are civil rights. Period. Using a community’s desperation to only be partially marginalized and discriminated against (as opposed to forcibly extricated from “polite society”) in order to get elected is disgusting. Especially for beneficiaries of the movement. And I’m not just talking Obama here: Women, Jews, Catholics, all minorities, and sometimes majorities…we all benefit together, or perish alone.